I'm a physicist by training, and an astronomy nerd at heart. The first digital camera I used (before they were even called digital cameras) back in the '90s was attached to a reflector telescope pointed at the night sky. Because of this, I've always had a soft spot for catadioptric, or reflex lenses. 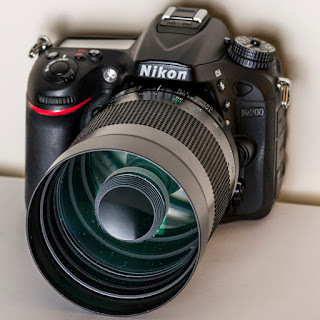 Most traditional camera lenses use nothing but glass to bend light in order to produce an image, but reflex lenses use a combination of lenses (dioptrics) and mirrors (catoptrics) to do so. The main benefit of such a design is that you can produce lenses with large focal lengths that have relatively short and light bodies. My Tamron 500mm is shorter and lighter than a pro 70-200 tele zoom, albeit slightly larger in diameter. It is considerably shorter and lighter than a traditional dioptric 500mm prime lens would be. They are also excellent at managing various aberrations because considerably less of the optical path is influenced by changes in index of refraction. There are, of course, downsides to reflex lenses, otherwise we'd see a lot more of them. They have fixed apertures that are slow compared to traditional dioptric lenses, and out-of-focus areas will take on a very characteristic, and often distracting, donut shape due to the central obstruction. Given their long focal length and slow aperture, they're not good for handheld photography in anything other than bright light, and, somewhat ironically, they can be hard to use on a tripod as well since they don't have much mass to damp any vibrations present; wind is a particular issue. Also, being something of a niche lens that has long since fallen out of favor, they haven't seen much of the way of improvements in the past 30-ish years (lesser optical performance*, no autofocus, etc.). Some companies still make them, but they tend to be geared more towards astronomers than photographers. My first reflex lens was a new model by Bower/Opteka/Samyang, a 500mm f/6.3. Although I liked a few of the pictures I took with it, I wasn't a fan of it overall. It was very girthy (it took 95mm caps! ), that extra girth didn't actually buy you any better light gathering ability (the central obstruction was so large that it performed much like an f/8), and the focus ring was too heavily damped for my taste. But what killed it for me was this: I had a really hard time getting good pictures with it. It was often so bad that I could get better results by shooting at 200mm on a kit lens and cropping to a 500mm field of view. I got a few neatly artistic pictures with it that I love, but that bulk combined with limited utility meant it had to go; I sold it to finance its replacement. Fortunately, I hadn't paid too much for it: you can find them for a little over $100 brand new. My second, and current, reflex lens is the Tamron 55BB 500mm f/8. Although it is smaller in diameter (82mm instead of 95mm) and one stop slower on paper than my previous lens, in some experiments I conducted for the short time I had both, they both had roughly the same light-gathering power, which was a pleasant surprise. It turns out that the central obstruction in the Tamron is proportionally smaller relative to the barrel size so less light gets blocked. Unlike my previous Bower, the focus ring feels much better, and it's easy to turn throughout the entire focus range without feeling sloppy. The Tamon also feels much more solidly built, which is a huge plus for me, and focuses more closely, going so far as to bill itself as a "Tele-Macro" lens. But the biggest difference is by far in the overall optical performance. While it still suffers from the same general limitations of being an older catadioptric lens, I can actually get reasonably sharp images out of it relatively easily. I did add a short generic lens hood to help control some lens flare, but it's hardly a necessity unless you're shooting close to the sun or backlit subjects. I say "relatively" easily because shooting with a light, fat, manual focus 500mm lens takes a good deal of practice and, ideally, a camera with good in-viewfinder focus indicators (like my Nikon D7200 has). You have a tiny depth of field unless your subject is a quarter a mile away or more, and anything out of focus turns "loopy" very quickly so getting your focus right is both tricky and important. You'll also want to try to focus on subjects that are largely parallel to your field of view for the same reason. Fortunately, most subjects that I tend to shoot (i.e. landscapes, boats on the water, etc.) are far enough away that I can just set the focus to infinity (which is clearly marked) and tweak it slightly around there as need be. Shooting surfers was hard...but I managed. I love this lens. While it is definitely a niche lens and will never substitute for, say, a 70-200 f/2.8 for general purpose telephoto shooting, I like being able to toss what is essentially a small telescope into my camera bag and not sacrifice much space to do so. While they haven't been made new for several decades, there are still a fair number available on the used market. My less-than-perfect example (plus the necessary Nikon adapter**) cost me about $100 at KEH.com, which is just a fraction of a modern tele zoom. At that price, this lens is a steal. In doing some research on adapting vintage lenses using the M42 screw mount to Nikon, I came upon something that I was previously unaware of. 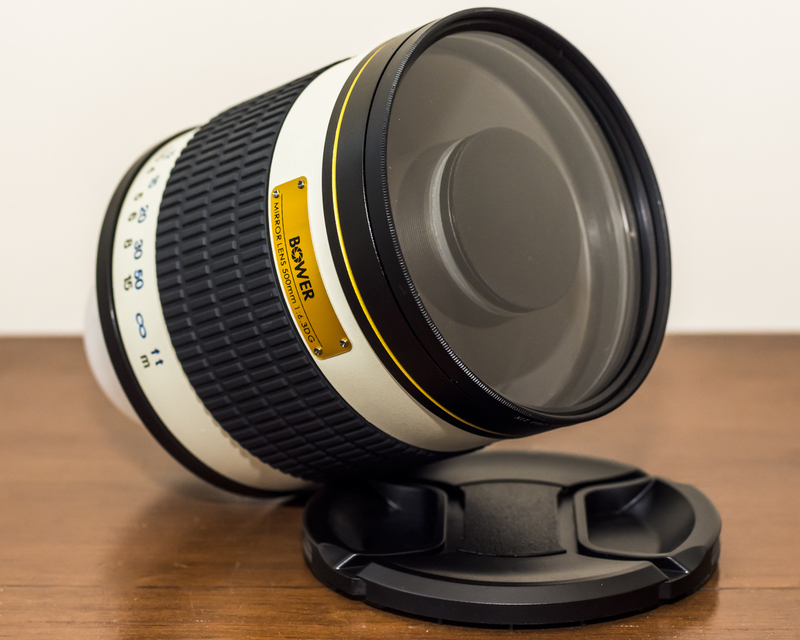 While you can physically adapt an M42 screw mount to a Nikon flange, the geometry of the arrangement generally prevents the lens from focusing at infinity unless your adapter includes a lens to alter the image slightly. This is almost certainly why I couldn't get clear images with my original Opetka reflex lens! The adapter I used didn't include any optics. All things considered, I'm glad that I didn't know this earlier because I do much prefer my Tamron, but I wanted to update this post so anyone reading it would know too. *One important thing to note is that at the kinds of ranges you tend to use a 500mm lens at, especially over water like I do, atmospheric interference is likely going to be the limiting factor on your image quality, not your equipment. ** This lens is part of the old Tamron Adaptall-2 series of lenses. All of the lenses came with a common mount designed to accept adapters for different camera bodies. Unlike the cheap, screw-on adapter used by the Opteka and other astronomy-based lenses, these adapters are well-machined bayonet mounts and feel very solid.